In a proof of concept study, scientists at Johns Hopkins report they have successfully performed 3-D personalized virtual simulations of the heart to accurately identify where cardiac specialists should electrically destroy cardiac tissue to stop potentially fatal irregular and rapid heartbeats in patients with scarring in the heart. The retrospective analysis of 21 patients and prospective study of five patients with ventricular tachycardia, the researchers say, demonstrate that 3-D simulation-guided procedures are worthy of expanded clinical trials. “Cardiac ablation, or the destruction of tissue to stop errant electrical impulses, has been somewhat successful but hampered by a lot of guesswork and variability in the way that physicians figure out which locations to zap with a catheter,” says Natalia Trayanova, Ph.D., the Murray B. Sachs Professor in the Department of Biomedical Engineering at The Johns Hopkins University Schools of Engineering and Medicine. “Our new study results suggest we can remove a lot of the guesswork, standardize treatment and decrease the variability in outcomes, so that patients remain free of arrhythmia in the long term,” she adds. In people with ventricular tachycardia, the electrical signals in the heart’s lower chambers misfire and get stuck within the fist-size organ, crippling the relaxation and refilling process and producing rapid and irregular pulses—or arrhythmias—linked to an estimated 300,000 sudden cardiac deaths in the U.S. each year. 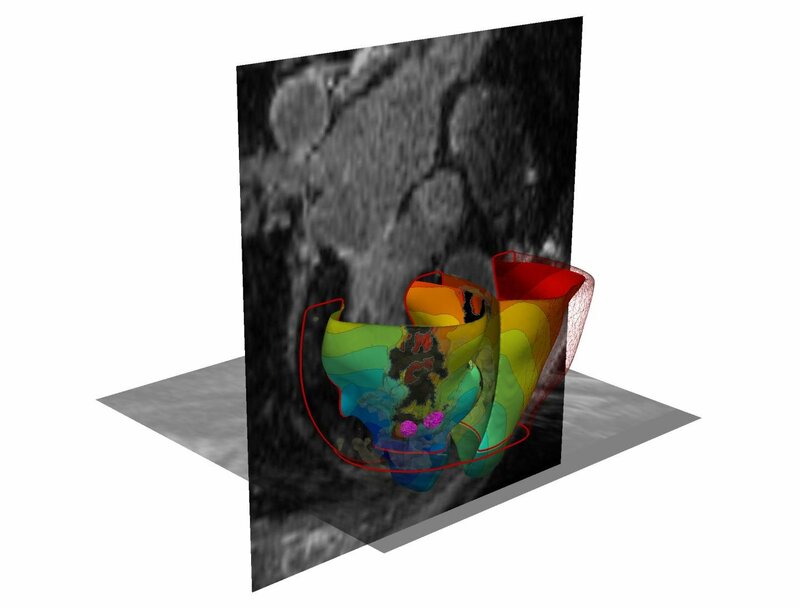 In a bid to locate arrhythmias more precisely, Trayanova and her research team developed 3-D personalized computational models of patients’ hearts based on contrast-enhanced clinical MRI images. Each heart tissue cell in the model generates electrical signals with the aid of mathematical equations representing how heart cells behave when they are healthy, or when they are semiviable when near the scar. By poking the patient’s virtual heart with small electrical signals in different locations, the computer program then determines whether the heart develops an arrhythmia and the location of the tissue that perpetuates it. Using the model, Trayanova then simulates an ablation to that area of the heart and runs the computer program over and over to find multiple locations that doctors should ablate on the actual patient. Among the experiments in the current study, Trayanova and her team used MRI images to create personalized heart models of 21 people who previously had successful cardiac ablation procedures for infarct-related ventricular tachycardia at The Johns Hopkins Hospital between 2006 and 2017. The 3-D modeling of these patients correctly identified and predicted the locations where physicians ablated heart tissue. In five patients, the amount of ablated tissue identified by the 3-D model was smaller overall—in some cases, more than 10 times smaller—than the area that was destroyed during the patients’ procedures. Next, the research team tested the 3-D simulation to guide cardiac ablation treatments for three patients with ventricular tachycardia at the University of Utah and two patients at the University of Pennsylvania. Two patients who received the simulation-guided ablation procedure have remained free of tachycardia throughout follow-up periods of 23 and 21 months. One patient who had the simulation procedure remained free of tachycardia after two months of follow up. In two patients, the virtual heart approach predicted that tachycardias would not be inducible—this was confirmed during the clinical procedure, so cardiac ablation was not performed. Trayanova says the results of a clinical trial are needed to validate the promise of personalized simulation guidance for infarct-related ablation treatments. Further clinical study planned at The Johns Hopkins Hospital was recently approved by the Food and Drug Administration under an investigational device exemption.